I've just purchased a Ultimaker 2+, having previously been running a Quant Q200 with UP! software. The Ultimaker produces a fantastic finish but the raft/support separation from the finish part, in comparison to the Quant Q200, is terrible! I find it almost impossible to remove any support because it is bonded to the layer that it is meant to be peel-able from. I have tried both Cura 14 and the Beta 2, but both produce similar results. I have even messed around with the raft to part separation distance, and the support density but neither really helped. However I have noticed that the Quant Q200 uses a different print angle for the raft & support layers compared to the first layer of the part. This must help by reducing the bond between the two layers. Is there the option in Cura to rotate the angle of the print for different layers? I'm not surprised that raft doesn't work great in Cura. Raft is an old technology from before the discovery of heated glass. Even before the discovery of painters tape. It's no longer needed so the developers probably never use it or care about it. Try printing on glass with a thin layer of PVA glue and heated. It's amazing. I can get my parts to stick so well i can pick up the machine by the part and swing the machine around the room and the part will NOT COME OFF until the bed cools down. I can give you more tips if you are willing to avoid the raft feature. I tried it and it works but with PLA, indeed the part sticks to it pretty hard, with ABS it's ok. Thanks for the replies. I can turn off the Raft and print directly on the glass but that does not solve the problem. It's the supports that I cannot remove from the part. My parts have features of different heights (in z axis and parallel to the glass plate), think of it like a cup, except the bottom is flat but also stepped. So the very bottom flat feature prints directly on the glass (without a raft) and then the support structure is required to hold the next plane that is a little higher in the z axis. It is this support structure interface to the part that I cannot remove. On the Quant Q200 it just peels & snaps away cleanly, on the Ultimaker it is like it is bonded. I usually design any supports by myself in the CAD program. Image: support test: trying various distances of support to overhang. Ridges are 0.5mm high and 0.5mm wide, separated 1.0mm from each other. Vertical gaps are between 0.2mm and 0.5mm, as indicated. - For large areas, I want a bit more distance between the support and the model, so it is easier to peel off, e.g. : 0.4mm. - For small and high detail models, a distance of 0.2mm works fine for me. This gives a rather smooth underside on the overhang, much better than with the standard supports. Less than 0.2mm is not recommended, then it becomes too hard to remove without doing damage. 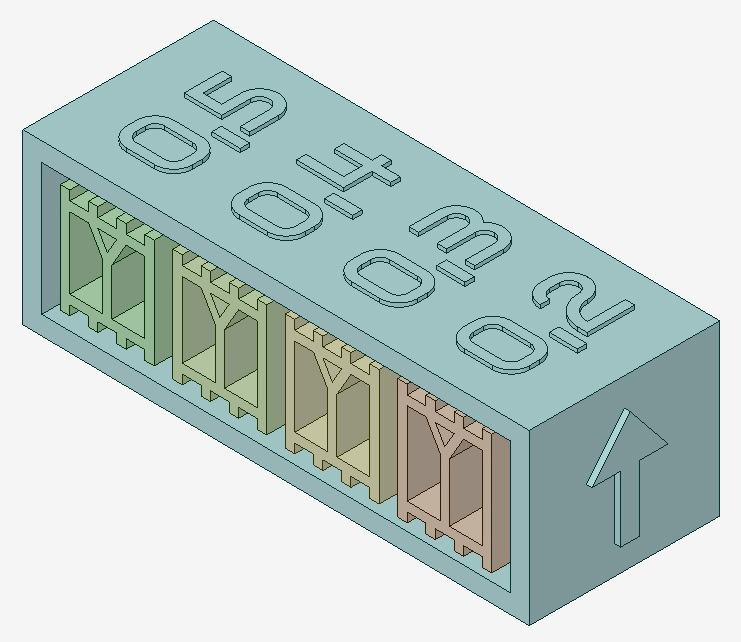 - A bit below the overhanging plane, I design a thin solid layer in the support, usually 0.5mm thick. On top of that layer I add ridges of 0.5mm wide, 0.5mm high, with gaps of 1.0 to 1.5mm in between them. The first layer of the overhang will print 90° rotated from these ridges, in my experience (verify in Cura Layer View). See the picture to get the idea. The numbers on top indicate the vertical gap in mm between the top of the ridges and the overhanging model. By using ridges the support is much easier to remove, in my experience (so the vertical gap can be smaller, thereby increasing quality). - To make support removal easier, if the model allows it, I design tabs and hooks into the supports, so I can pull them out with pliers or other tools. I also try to provide openings for cutting any unwanted strings with a knife. Plus vertical openings, to separate various parts of the supports (so they don't turn into one solid block that can't be removed). On those parts of the support where I need a good grip or need to pull hard for removal, I make sure they are strong enough. Ideally, I try to design the support so that I can cut it loose (cut unwanted strings and hairs), and then pull it out in one shot, without hundreds of little pieces still sticking to the model. In the shown model, I can stick a plier in the supports and pull each part out easily. - In some cases I just place a lot of layers on top of each other as support, each separated by a gap of 0.5mm. Thus: a solid layer of 0.5mm, then gap of 0.5mm, then next layer of 0.5mm, next gap of 0.5mm, etc... And finally a layer with ridges on top. In this way, I can peel off layer by layer. It just depends on the model, its size, the required acuracy, the deadline, and my mood of the day (if I want to experiment or not). I have also seen several models made by others with custom supports. The standard supports are good for general use. But for specific cases, I think it is better to design your own, since there is no standard that suits all. Supports have options - click the "..." and set the Z distance to more than layer height. For example if your layer height is .2mm then make the Z distance .3mm. This will keep the supports from sticking so much. Or you can use "lines" instead of "grid". This is good for supports that are very short. Personally I usually avoid cura support and generate custom support in CAD instead. But sometimes I use it and it usually breaks away just fine for me - especially if it's very tall. I use wirecutters and cut them in the middle and remove large chunks at a time starting near the middle of the support (half way up). But for very short supports that won't work as well. You can try wire cutters (or needle nose pliers) and twist the support off from below. That sometimes works. It depends on the size and shape of your overhang - every one is different. You want to break it up into several small columns of supports so each one breaks off separately from all the others.